Box Text: The ALIENS are fast, spit acid and are right behind you! The motion tracker is your only warning. No time to think, no time to catch your breath... RUN! Can't see very far ahead in these air ducts. Hard to breathe. Face-huggers can be anywhere. You have the firepower... blast the ALIENS with your machine gun, flame thrower and grenade launcher. You know what you have to do... rescue the trapped prisoners and end this nightmare! Just keep telling yourself, "This isn't really happening. It's only a game!!!" 10-13-2012 exonerator Box Text The ALIENS are fast, spit acid and are right behind you! The motion tracker is your only warning. No time to think, no time to catch your breath... RUN! Can't see very far ahead in these air ducts. Hard to breathe. Face-huggers can be anywhere. You have the firepower... blast the ALIENS with your machine gun, flame thrower and grenade launcher. You know what you have to do... rescue the trapped prisoners and end this nightmare! Just keep telling yourself, "This isn't really happening. It's only a game!!!" 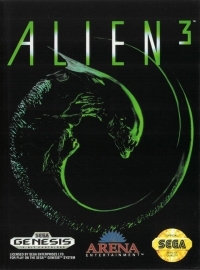 This is a list of VGCollect users who have Alien 3 in their Collection. 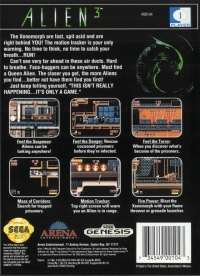 This is a list of VGCollect users who have Alien 3 in their Sell List. This is a list of VGCollect users who have Alien 3 in their Wish List.